Kenneth Omollo was the best performer for Kenya at the just concluded Zone 4.2 Individual Chess championship held in Kampala, Uganda after graduating to a Candidate Master. He finished ninth with five points from a possible nine beating Harold Wanyama of Uganda and Yusuf Mdoe from Tanzania in tie break. After a mixed start to the championship, Omollo registered three wins and two losses in the final rounds of nine. He beat Primulus Kasaija from Tanzania and Uganda’s duo of Harold Wanyama and Haruna Nsubuga with an identical 1-0 score. Omollo’s losses were inflicted by Ethiopians Mesfin Leykun and Haileselassie Tadese. “Along with the entire chess loving population of Kenya, I congratulate you on being awarded the title of Candidate Master after your superb performance. Together we salute you,” read a congratulatory message sent to Omollo by Chess Kenya CEO Satish Deshpande. His compatriot Ben Magana finished 15th with four points. In his last games, Magana beat Kasaija, Tanzanian Max Munisi and Gezachew Abera of Ethiopia 1-0 but lost to Wanyama and Nsubuga with a similar score. Magana's best moment at the championship was holding Egyptian Grandmaster El Gindy Essam to a tough draw of round one in a game that lasted for a long period. 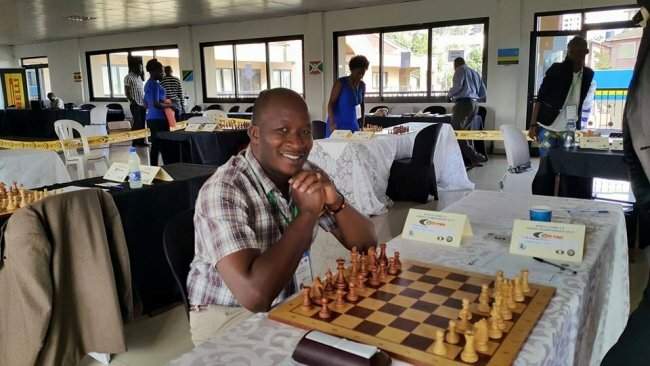 Uganda’s Arthur Ssegwanyi, who plays for Equity Chess Club in the Kenya National league, was the overall winner with 7.5 points and scooped the prestigious International Master title. He qualified for the Chess World Cup to be held in Baku, Azerbaijan from Sept 10- Oct 4. In the women's category, Kenya’s upcoming player Daphne Mwikali from Kenyatta University finished with a decent aggregate of four points out of the possible nine. In the closing rounds, she beat Joan Nakimuli (Uganda) 1-0 but lost to Uganda’s Goretti Angolikin and Grace Kigeni as well as Tasneem Ehab of Ethiopia. This was her first international exposure. Egypt’s Woman Candidate Master Ehab Tasneem won the overall title with eight points which earned her a qualification to World Cup. Meanwhile, FIDE Arbiter Purity Maina has been chosen to arbitrate at the African Individual championship 2015 to be held from May 1- 13 at Sharm-El-Sheikh, Egypt.